← The Government says My Health Record data is safe, but how is a privacy breach defined anyway? Coles will continue handing out plastic bags for free in its stores indefinitely, bowing to customer pressure and saying shoppers “need more time to make the transition to reusable bags”. Most state governments in Australia have banned thin single-use bags, and the supermarket giant pledged to phase them out from July 1. Now, thicker reusable bags which had previously cost 15 cents each will be handed out for free. That decision has annoyed environmental groups, who warned the reusable bags are worse for the environment if they are discarded into waterways and habitats. In a statement today, the supermarket chain said complimentary bags were still an “interim measure” to help customers make the transition to reusable bags. “Some customers told us they needed more time to make the transition to reusable bags,” a Coles spokesperson said. “We will continue to listen to our customers and our team members on an ongoing basis to assess when customers have become accustomed to bringing their own bags, and will provide them with as much notice as possible,” the spokesperson said. Every state and territory except New South Wales has either outlawed single-use plastic bags, or has plans to ban them. Coles and rival Woolworths last year announced plans to phase out single-use plastic bags. Woolworths had been giving out an estimated 3.2 billion lightweight plastic bags annually. “Many customers bringing bags from home are still finding themselves short a bag or two so we are offering complimentary reusable Better Bags to help them complete their shopping,” the Coles spokesperson said. Environmental lobby group Greenpeace said Coles’ decision was bad for the planet. “Coles have caved in far too quickly to a small but vocal minority and there is absolutely no doubt Coles will be punished for this decision by customers who don’t want to see plastic bags littering their beaches and killing marine life,” Australia Pacific campaigner Zoe Deans said. However, if reusable plastic bags reach the oceans and other habitats, they could cause as much if not more damage than single-use bags currently do. That is because they take longer to break down. Jon Dee, who started the National Plastic Bag Campaign in 2002, said Coles’ decision was odd. “Coles cannot continue to give away what are now thicker plastic bags which are even more problematic — they can’t continue to do that on an ongoing basis and they need to put a cut-off point [to] stop giving them away,” he said. Mr Dee said a previous trial of slightly thicker plastic bags, run by the National Plastic Bag Campaign, showed the number of customers who returned to reuse them was “pathetically low”. “This decision makes a complete mockery of Coles’ claim to want to reduce plastic waste and is a betrayal of the millions of their customers who want the supermarket to do the right thing in favour of a vocal minority,” Ms Deans said. Co-founder and CEO of Take 3 for the Sea Tristan Silverwood said the bulk of the population was accepting of the bag ban. “What we’ve got at the moment is incredibly ripe environment to take a bold stance on reducing waste and reducing plastic pollution,” he said. Harris Farm Markets again demanded the New South Wales Government ban single-use plastic bags and warned Woolworths not to copy Coles’ latest move. “We now renew our call to Gladys Berejiklian and the State Government to enforce a ban of single-use plastic bags immediately. We also call on the board of Coles to reconsider this decision for the sake of our planet,” co-CEO Angus Harris said. The controversy around plastic bags comes as customers attacked Coles for giving away toy plastic replicas of some of its grocery products last week. Coles is handing out a collectable range of 30 mini-products, from Vegemite jars to Tim Tams, as a promotion. It is also selling plastic-lined cases to store them in. 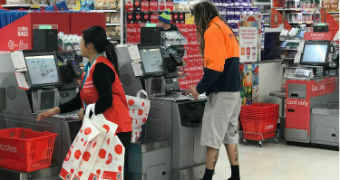 While Coles will be giving out free bags in most other states, Tasmanian shoppers will have to keep paying for reusable bags at checkouts. 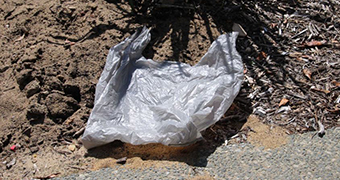 Single-use bags were outlawed in Tasmania in November 2013 and shoppers have been paying for reusable bags at both Coles and Woolworths since. A Coles spokesperson said the free bags would only be given to Queensland, New South Wales, Victoria and Western Australia as an ”interim measure” to allow customers time to get used to bringing their own bags. The spokesperson said as Tasmanian customers used reusable bags for years, customers there will not be given complimentary ones. Shop Distributive Allied Employees Association Tasmanian branch secretary Paul Griffin said the union will be monitoring the situation to ensure Tasmanians are not paying more than mainlanders for reusable bags for an extended period of time. Posted on August 5, 2018, in ConspiracyOz Posts. Bookmark the permalink. 1 Comment.